CLICK HERE for 360 degree virtual tour! 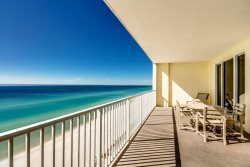 Welcome to "Emerald Gulf" our luxury beachfront home located off of Thomas Drive in Panama City Beach! Home Away Listing 4797611 This 2-story home features 5 bedrooms plus a bunk area, 4 bathrooms and sleeps up 25 comfortably. The spacious dining and living area features beach views, direct beach access, and one sofa sleeper. The beachfront master suite has a king bed, access to the deck, and an adjoining private bathroom. Also located on the first floor is guest bedroom with two queen beds, bunk area with 3 twin beds, and a full size bathroom. The second floor living area offers a queen sofa sleeper and access to the beachfront balcony. This level also features three bedrooms and two full bathrooms. The beachfront bedroom features a king size bed while another guest bedroom has two full beds. The third guest bedroom upstairs will accommodate up to six occupants and features two sets of bunk beds, one with a full over a full and the other with a twin over a twin. Exterior features include spacious parking for up to eight vehicles, beachfront deck spanning the length of the home, gas grill, and two outdoor showers. This home is pet friendly so don’t forget your pups! $150 non-refundable pet fee is required. Minimum Age Requirement for Groups of Young Adults & Vacationing Students - All occupants at least 25. Please note, this age requirement only applies to reservations for unchaperoned groups of young adults/vacationing students. Our rentals are family friendly only, children are welcome. I worked with Lauren when I needed to extend my stay. She was very responsive and helpful! My family enjoyed our stay tremendously. After being displaced from our home due to Hurricane Michael, this home was such a nice reprieve from the stresses in our day. The views of the gulf can not be beat! This home is spacious, clean and lovely! The booking process was easy. They sent the check-in information and wifi info one week prior to check in. It was fantastic. The house was very clean and all it had all the necessities. We really enjoyed our stay at Emerald Gulf. Lauren was very helpful and sweet when I called to change my reservation a couple of times. Everyone was extremely kind and accommodating. Helping us find a property last minute, that not only worked beautifully for my family, but was welcoming to our dog and our budget! Thank you for helping us get out of a poorly ran rental, for a better price, location, and staff! Originally made a call to request to view the property prior to booking. Your team member set an appointment as soon as house was available, gave us a tour and was VERY nice and friendly. We have rented from other companies that would NOT allow us to view the property prior to arrival date. The fact that you allowed us to do this was a huge factor in us booking with you! We were a family of 9 with 7 more staying in a near by Condo. House was big enough to accommodate everyone and we even had a family dinner with all 14 of us able to sit in the same dining area. Back deck is HUGE and furnished with lots of very nice patio furniture and a large table with chairs and umbrella! The 2 (yes 2) outside showers came in handy!! One on the back deck is private and even has hot water. BEAUTIFUL BEACH HOME! You have been professional, accessible and the process was made easy for our large group. This was made simple and user friendly. Thank you!!! We loved it!!! I cannot tell you how the house made the difference for our large family to congregate, eat meals together, and hang out on the beach together. It provided the setting for each of us to recharge, reconnect as family, and build beautiful new memories. We are grateful-I cant wait to rent it again in the future! Our family schedules a "family trip" about every 2 years. Never has completing this process been easier or more professionally handled than with the people at Ryan Realty in Panama Beach. All questions ask recieved prompt and accurate information. Great people to deal with. We spoke with a few team members prior to and during the check in process- They were extremely helpful and did everything they could to make this getaway perfect. We had the best vacation we have ever had- the property was amazing- I have never stayed in a house before that was better than the description. All of the rooms were huge, the home was up to date and spotless. Beautiful Property, can't wait to come back!!! I stayed at the property with 10 adults and their children. There was so much space. The home is well kept, clean and spacious. It was so nice stating on the beach and having it only a few steps from the shore. My favorite part was being able to hear the waves at night. The house was equipped with everything you would need on vacation. The responses from the staff to common questions were very timely. Amazing service. Everyone was happy with the property. The house is large and nice! Perfect for our party of 12 and a great price for what you get. The parking is large enough for 6 full size trucks so it's plenty for 8 cars. Everything interior is all anyone would want, clean updated kitchen, bedrooms, and bathrooms and the back porch is perfect for hanging out when not on the beach! Gorgeous house with tons of room! Fantastic view of the water with a great deck and shower outside leading to the beach. Plenty of parking at the house and close to restaurants and activities! Loved it, loved it, loved it!!! very great, would come back again!